organized by Faculty of Economic Sciences, Warsaw University of Life Sciences – SGGW (WULS- SGGW) on Thursday, October 20th, 2016 in Warsaw. The main aim of the conference is to exchange scientific ideas and practical knowledge on the challenges in the production of pork in Poland. For many years, the economic situation on the pork market in Poland has been worsening. This is evidenced in particular by the reduction of the number of pigs, the negative balance in foreign trade, small scale production of pork in most households, the lack of full capacity utilization in slaughterhouses and processing plants, etc., In this situation, made the conference becomes particularly important and requires initiated discussions and research in this area. Conference will include the plenary session, thematic sessions, a poster session. We believe this conference will be a highly rewarding educational and networking experience for all participants. We invite you to actively participate in the conference and preparation of a paper associated with the pork market. Your participation in the Committee will certainly enhance the prestige of this journal. Please, pass the information about the conference among your colleagues and friends. Accepted papers after receiving two positive reviews will be published in the special monograph. 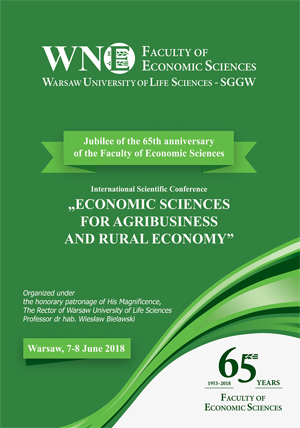 For detailed information, please refer to the enclosed leaflet as well as the Conference webpage: http://www.wne.sggw.pl/konferencje/. We are looking forward to sharing experience and knowledge with you!